. . . More here . . . I really wish I could afford to go and see it! Rather interesting that Baphomet is supposedly a hermaphroditic God. That is, this statue is missing the feminine characteristics of the mammaries (breasts). So, this appears to be the over-masculinization of Baphomet (IMHO). Also, rather interesting that some refer to him as “Satan”. This is NOT CORRECT! This is the image of Baphomet as depicted originally by Eliphas Levi. Satan comes across as a composite image from several different (originally) Pagan Gods and images melded together, and given (by the early Catholics and Christians) the various epithets and titles of evil and mendaciousness. This was a tactic by the early imperial churches to malign the Pagans they were busy torturing and forcing into converting to the new religions. Baphomet is pictured as having one hand elevated, and the other lowered: To represent the “As Above, So Below” principle of the known existence(s). Baphomet is more significant with balance, especially between Light and Darkness. There is very little aspect of “evil” about him/her/it/them that is realistic. 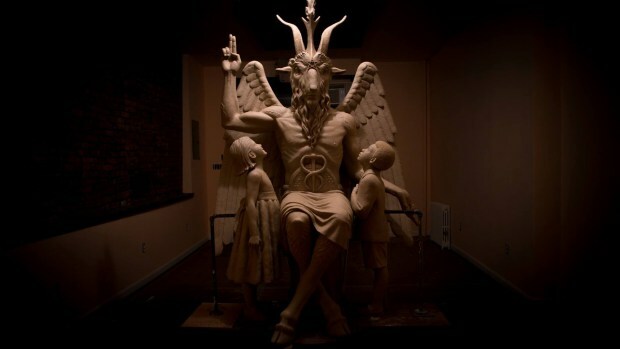 Those who manage to afford the $75.00 / per person admission to go as “VIP Guests”, may get some photos of themselves with the bronze statue of Baphomet. – I would LOVE to hear about your experiences!